Today is your lucky day. 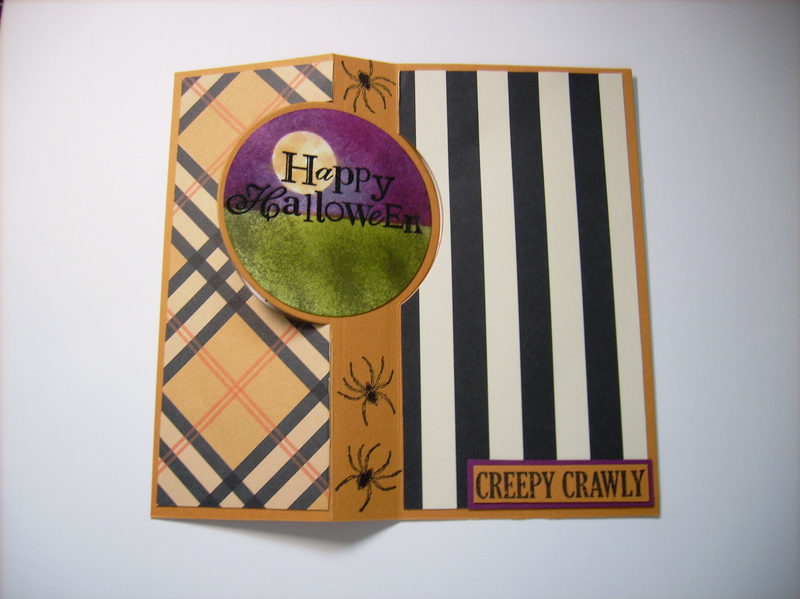 Not only is it Halloween but 3 postings in 1 day by all 3 sisters at 3sisters2stamp.com. This post is the colorful Halloween treats that Cammie made for her husband’s office staff. 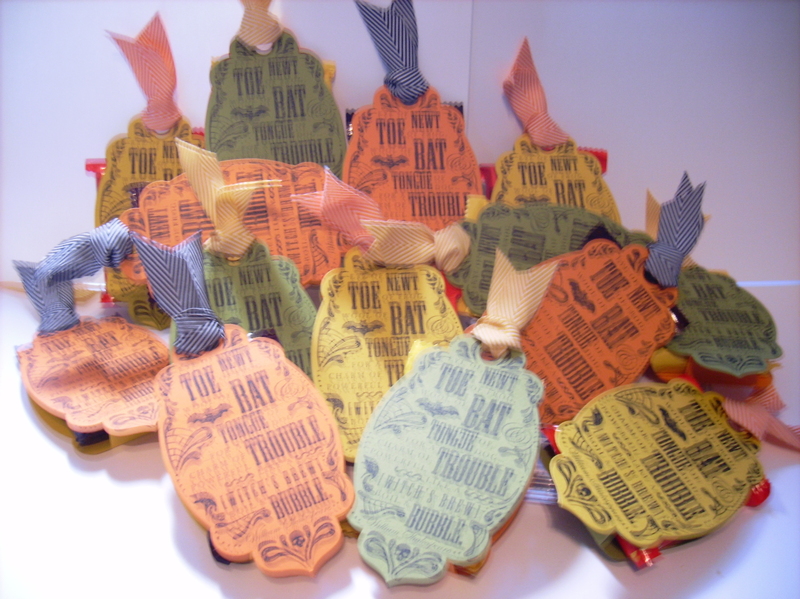 She used fall colored cardstock and stamped the Toil & Trouble stamp set #131727 from the Stampin Up holiday catalog and then cut 2 out using the Apothecary Accents Framelit #127003. She then made a little box and put the stamped image on each side of the box and added a mini candy bar. The treat box was closed using the yummy 3/4″ Chevron ribbon. Super fun and easy treats that can be enjoyed for kids and adults of all ages! I love Wizard of Oz, Wicked and love the Stampin Up Wicked Cool stampset (no longer available) even more. So imagine my excitement when my sister/ upline taught me how to land the house on the Wicked Witch of the East. Just used a dauber to create the siding and the grass. Added a window pane complete with a spooky spider web. Here’s hoping you have a Wicked Cool Halloween too. Happy Halloween! This is not a trick – baby sister Blair is featured today with her Halloween treats she made for her staff. No stamping involved. 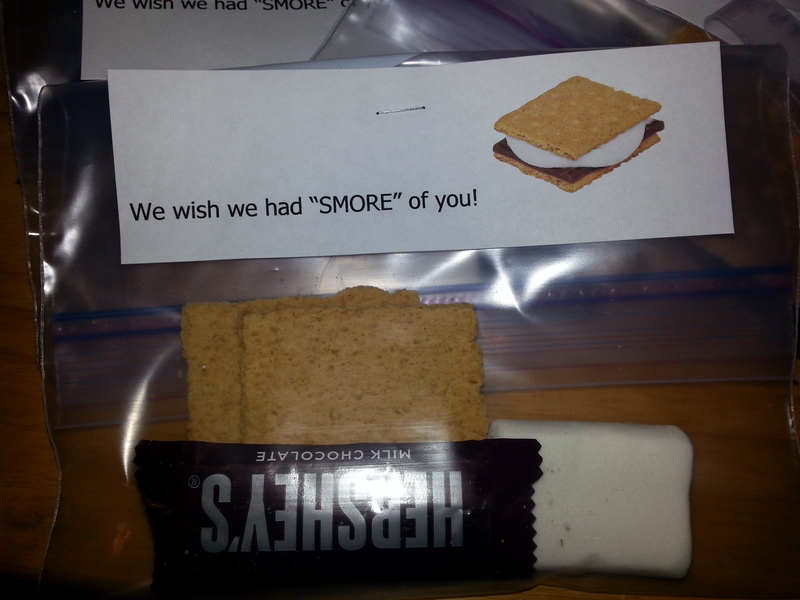 She made the treat topper and printed it out on whisper white cardstock and adhered it to a treat bag filled with all the smore fixins. Super cute and her staff will be enjoy them. Since it is Halloween, I will have a treat later today…. a second post to reveal my favorite Halloween card I made this year. So stay tuned. I could not resist when I got this super cute pix from Cammie that I decided to make 2 posts today. 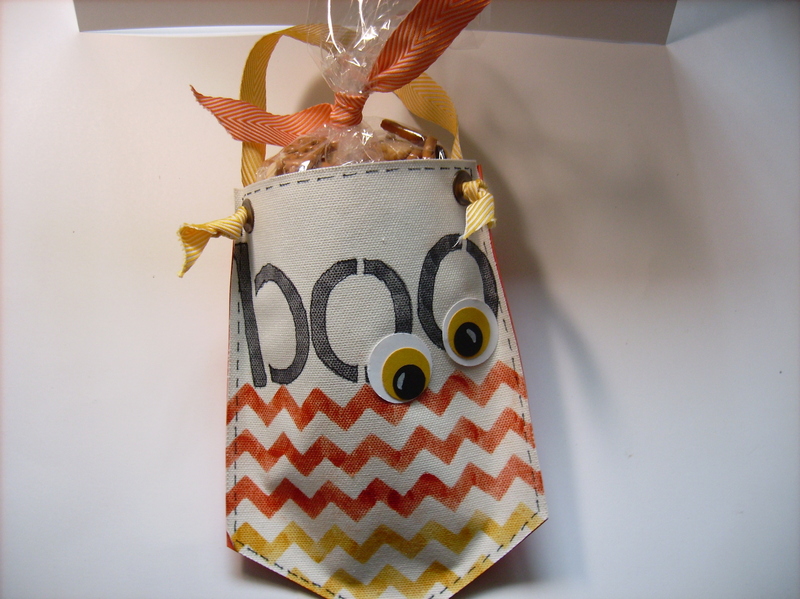 This little canvas treat bag was made using the Build a Banner kit #133507 from the Stampin Up holiday catalog. Leave it to Cammie to find a cute way to use the kit in a non traditional way. The kit comes with the pre-grommeted canvas pieces, the several stencils to use with daubers (alphabet and chevron stencils were used) and Cammie added DSP to the back to make a pouch. The handle was made from the Crushed Curry Chevron Ribbon #130018 from the Stampin Up annual catalog. She added a healthy snack mix and tied it off with a piece of Pumpkin Pie Chevron Ribbon #130015. She then punched and made eyes using a variety of the Stampin Up circle punches. Cammie made these cute treat bags for her select neighborhood trick-or-treaters. What a great Halloween keepsake these are! I plan on ordering this kit and the backup banner kit #132699 to make santa pouches. 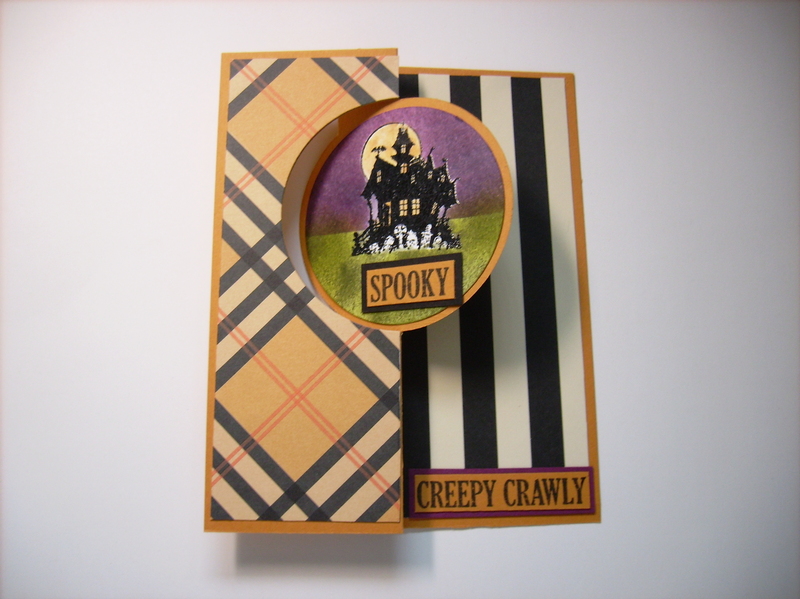 Cammie pulled out all the goodies to make this terrific interactive Halloween card. She used the all new Stampin Up Thinlits Circle card die#133480 that cuts, scores and creates a card that flips in just 1 easy step. How exciting and fun it was to create such a cute and interactive card in a few minutes? Please note that the fabulous DSP that Cammie used on this card is no longer available but any DSP in your stash would do. 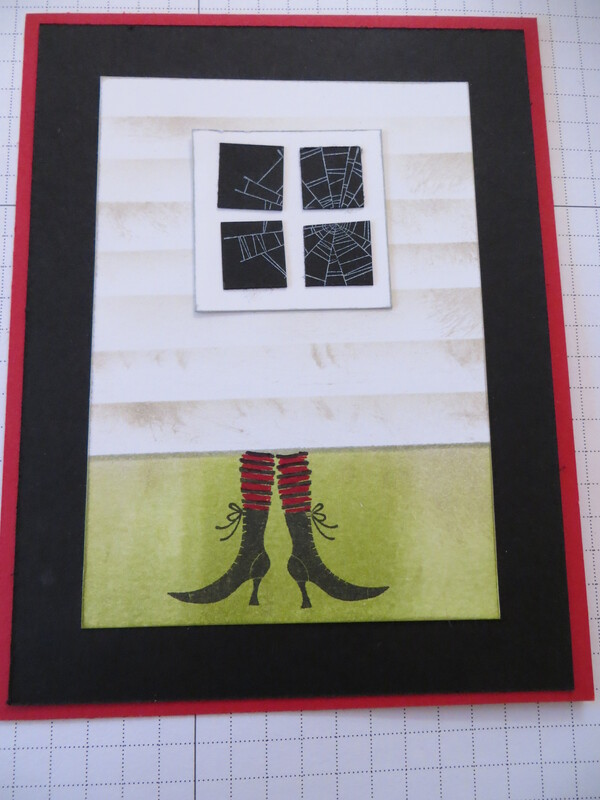 A classic Cammie card these days would not be complete without brayering so she brayed the outside and inside flipped circle pieces and incorporated the Best of Halloween #134381Stampin Up stamp set. The Best of set is one of the 12 stamp sets that Stampin Up has been introducing throughout 2013. Each month a new set comes out that combines favorite images from the past 1/4 century and 1 new never seen before image into 1 set. The sets are available to purchase through March 2014. Check out all the best of Stamp sets that have been introduced to date and don’t miss out! The thinlit circle card die is not the only thinlit card die available. Stampin Up also sells a thinlit label die #133479 that has the same functionality as the circle thinlit except there is a label rather than a circle flip. Plus the accessory pieces are different too. Another Tuesday is here and that means new Digital Download day at Stampin Up! I am hoping today’s MDS scrapbook page will send positive vibes to the Stampin Up MDS digital download team to come up with a new easel calendar download to make my life easier. I love the quality of the MDS calendars and want a template so that I don’t have to put all the dates in by hand. 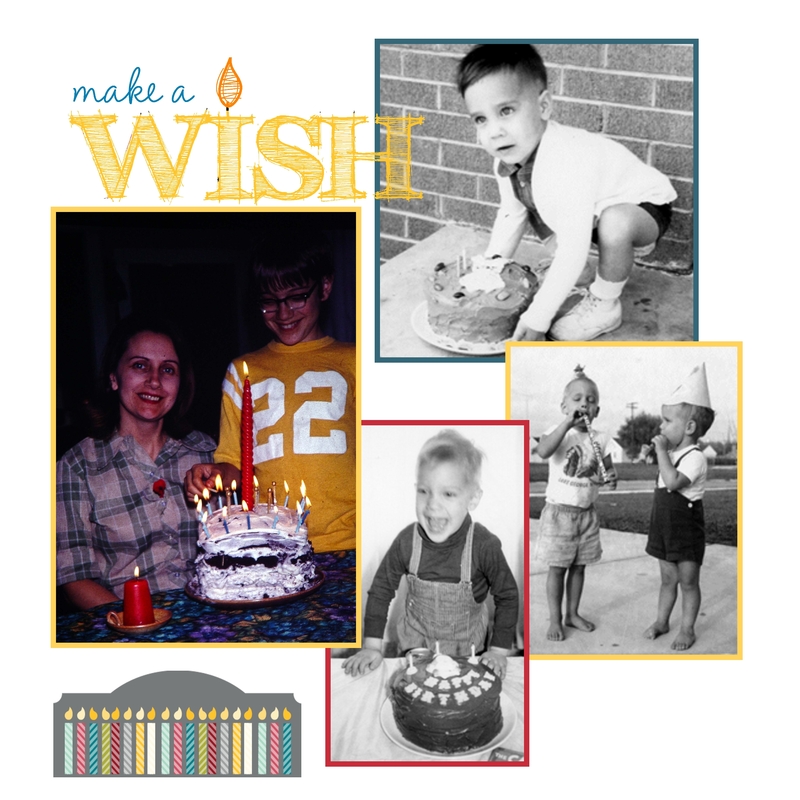 Please grant my Wish Stampin Up My Digital Studio team! Anyhow, today’s page is a birthday page that I made for my mother inlaws book. It is the simplest of pages and it is even done with a whisper white background. Who does that when there are so many fabulous digital background pages to choose from? I guess I did because it made the make a wish stamp brush show up better. I used the new coloring tool to color the stamp in more than one color. I added colored mats to each picture and added a candle embellishment and said done! The pictures are what make this page so cute. Speaking of cute that is my husband in the upper right picture with the blue mat trying to pick up his own cake. Be sure to check out the newest downloads for MDS available on the Stampin Up site. I will be checking the downloads to see if my wish has been granted. 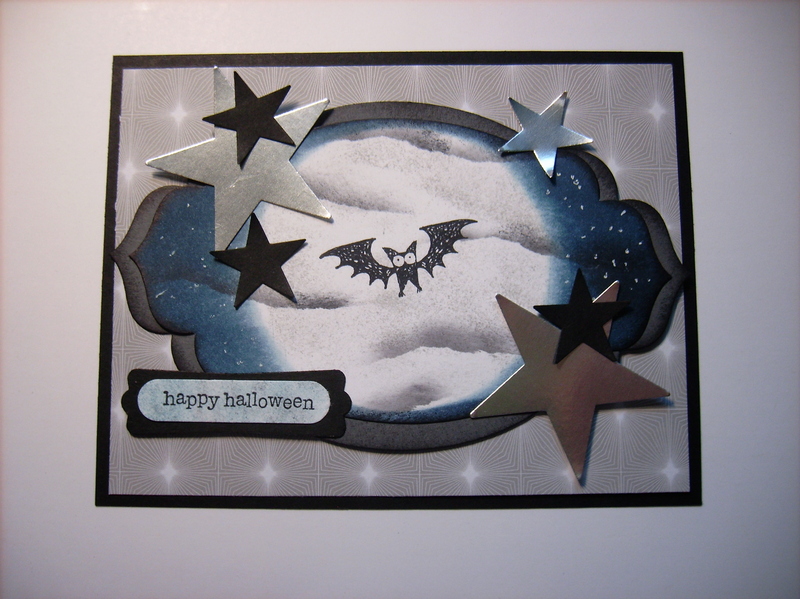 Today’s card is one of Cammie’s fantastic Halloween brayered cards. What is great about this card is that Cammie used the Winter frost DSP#132341 as the background paper in an unconventional way. The Winter frost DSP is traditionally a winter themed paper but when used with Halloween stuff it can be transformed into a whole new purpose. Cammie used a double layered Apothecary Accents Framelits #127003 as the focal piece to brayer here spooky full moon background scene and added a bat from the Halloween Hello stamp set #131718. She scattered die cut stars cut from black cardstock and the all new silver foil #132178 paper. The sentiment is from the Teeny Tiny Wishes #128748 stampset and used the word window #119857 punch and layered it on the modern label #119840 to complete the Halloween card.